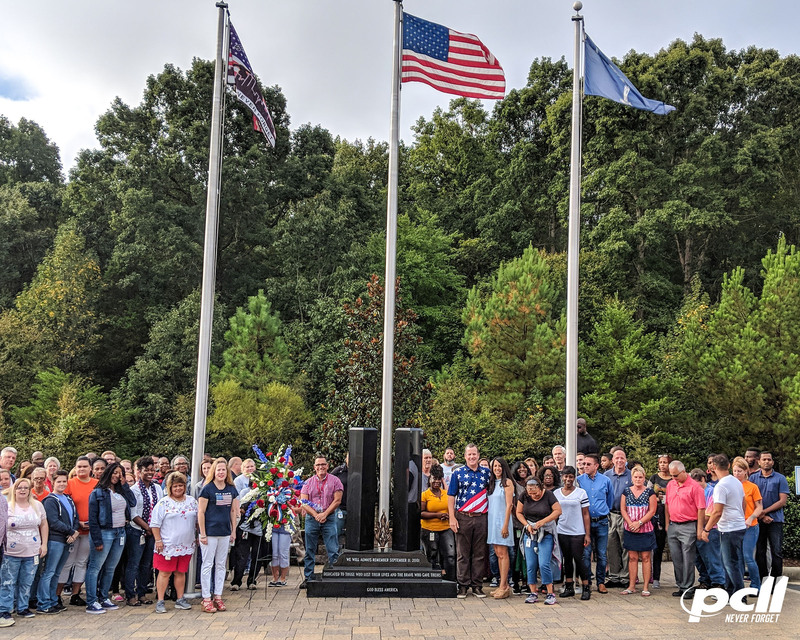 On September 11, 2018 the employees of PCI Group gathered at 8:46 AM outside the company’s headquarters to honor the brave men and women who lost their lives on September, 11, 2001. This year marks the 17th consecutive year that PCI has gathered to honor the 2977 civilians, firefighters and rescue workers that were lost during the attack. The gathering took place in front of the 9/11 monument constructed just outside of the entrance to PCI in 2011. The monument features two towers (symbolic of the Twin Towers attacked on 9/11) which are constructed of 100% solid, jet black granite with a polished mirror finish. Inscribed on the front of the base of the towers are three commemorative passages: “We Will Always Remember September 11, 2001”, “Dedicated to Those Who Lost Their Lives and the Brave Who Gave Theirs”, and “God Bless America.” As a reminder for future generations, the expressions “Celebrate Life” and “Salute America and Its Heroes” are inscribed on the back of the base. Between the towers is a hand-crafted bronze eternal flame. Framing the monument are two benches and three flags: the American flag, a 9/11 flag, and the South Carolina flag. PCI Group is a leading provider of mission critical communications for businesses where security of customer-centric data is paramount, precision and accuracy are crucial and compliance is a must. As a family owned business since 1970, PCI Group has been providing customers fast, secure, and cost-effective printing and document delivery that is fully compliant with federal regulations including HIPAA, FISMA and SOC I & II and PCI DSS. PCI’s real-time, web-based, customer control center enables customers 24/7 access to updated information and tracking reports about their communications at any point from pre-production through delivery. 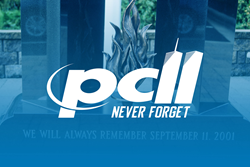 For close to 50 years, PCI Group has been the company customers can rely on to handle every detail—time after time. For more information about PCI Group, please visit us online at http://www.pcigroup.com.